ST. JOSEPH and HOLY TRINITY CATHOLIC PARISHES are a welcoming Catholic community, alive in Christ, living out His message in love and service to everyone. St. Joseph Church is at 500 N. Mesa Verde Avenue in Aztec, New Mexico. Holy Trinity Church is at 42 Road 3520, Flora Vista, New Mexico. Click here for MAP. Our parish office is at Father Owen Center, across the street from St. Joseph Church, at 424 N. Mesa Verde in Aztec, NM. Your generosity to our Parishes helps the Church dispense the Sacraments to the faithful, provides Catholic education and formation to our youth, extends pastoral care to the ill and dying, helps those most in need locally, nationally, and internationally, and brings CHRIST to all. Everyone in our parishes has free unlimited access to FORMED! Register on the left column. FORMED is a great resource online, offering a large selection of movies, video-based study programs, hundreds of eBooks and Lighthouse Talks, in English and Spanish, for adults and children, to enliven your Faith. FORMED is the Catholic Faith online, on demand. 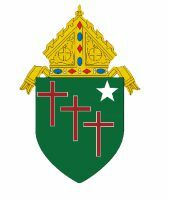 The Churches of St. Joseph in Aztec, and Holy Trinity in Flora Vista, belong to the Catholic Diocese of Gallup in New Mexico, U.S.A. Click the Diocese crest on the right to go to the Diocese of Gallup website.